The Sterling Water Softeners are a great product. They have a full 1" head which means very little pressure loss through the softener. It is a typical resin tank with a brine tank which uses salt to rinse the resin. Sterling water softeners are also electrically operated and regenerate based on the water hardness level and the usage. 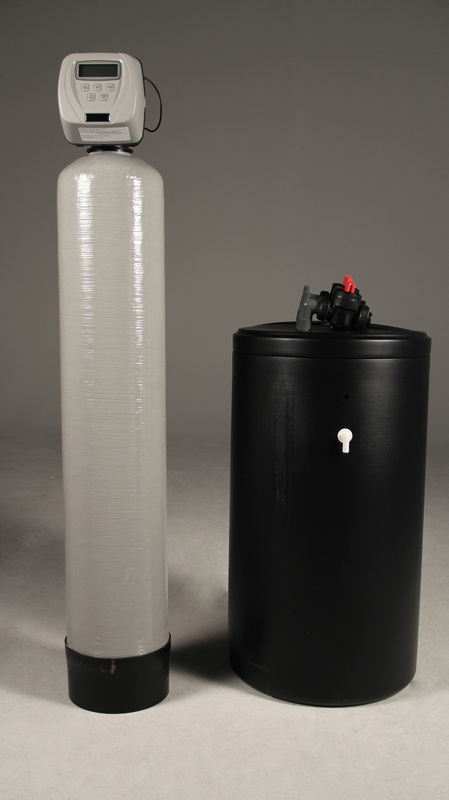 You can set the water softener regeneration time to happen when you and your family are asleep at night. Sterling's unique microprocessor based control head monitors system performance, water consumption and more such as: Days since last regeneration, Gallons since last regeneration, reserve based on water usage over last 21 days, total regeneration since startup, total gallons of water used since startup and many more options. If power fails the only thing you have to reset is the clock. Sterling's Iron Reduction System has a lot of really neat features such as No Chemicals, No in line venturi to plug or adjust, No air compressor, No excess air, No air release valve required, Less maintenance than other brands, rugged Mechanical piston valve so there are no solenoids or flapper valves to stick and a full flow bypass valve. For More information on which kind and what grain softener would be best for your individual application Please call us and we can get your questions answered.